Connect with like-minded people for a 7-day spiritual experience in Tuscany, Italy! Marian and Garrett of Western Spirit Enrichment Center have been offering (non-religious and non-denominational) spiritual retreats to individuals and couples in Sedona, AZ since 2001 and have experience guiding thousands of guests on their spiritual journey. Your hosts have visited Italy numerous times and have lived in a small village near Lucca. They are quite familiar with the area, local attractions, and enticing restaurants. Marian’s Italian language skills will enable our retreat guests to communicate with the friendly locals. You will stay 7 nights in a historic and authentic stone agriturismo, located in the beautiful and tranquil countryside of Tuscany, approximately fifteen minutes from the historic walled city of Lucca. 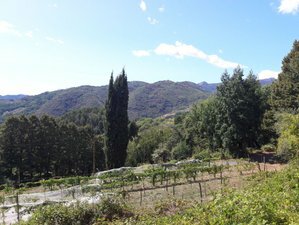 An agriturismo is a rural farmhouse (under this family’s ownership for four generations) that offers guest accommodations and locally-produced honey, olive oil, wine (which are available for purchase), fruit, and vegetables. The lodge, surrounded by a lush green forest and walking trails, is recently renovated and modern, with full bedrooms, bathrooms and kitchenette facilities. There is also a sparkling pool on the property for cool dips on hot days. During the retreat, you will receive 8 workshops in total. These workshops will guide you gently along a path of self-discovery, forgiveness, and healing, regardless of your faith or religious background. They are based on the universal principle that God is love and all humankind is connected. Whether you are just beginning your spiritual journey, or are an ‘advanced soul’, these empowering workshops will enrich your life. Western Spirit Enrichment Center's interactive workshops may include discussions, role-playing, music, meditation, and other creative activities. The format, environment, and very small group setting ensure that you will receive the personal attention and time you need to feel secure, loved, and respected, as you bond through introspective, thought-provoking, and self-challenging exercises. Your full and honest participation is necessary, for you will only receive value from the workshops if you are willing to invest of yourself in them. You will meet and share a wonderful evening meal as the group review the week’s agenda. 12:00 - 17:00 Lunch and trekking on the Via Francigena trail, an ancient road and pilgrimage route traveling from Rome to the Alps of France. Dating back to at least the year 725, it was one of the most important roads of travel and commerce from Rome northward. 12:00 - 17:30 lunch and tour of the exceptional Villa Reale, once the home of Napoleon’s sister, the Duchess of Lucca Elisa Bonaparte Baciocchi and its numerous renowned gardens, waterfalls, and botanical rarities. Disclaimer: Western Spirit Enrichment Center reserves the right to change any portion of this retreat program, as necessary. All retreat participants are required to sign Western Spirit’s liability release form prior to departure. A copy of the form will be furnished to you in advance and must be returned to Western Spirit before departure. Tuscany (Toscana) is a region in central Italy, some say the most beautiful part of the country, comprised of lush green rolling hills, nature reserves, olive groves, vineyards and their wineries, mountains, including the Apennine Mountains, and the Tyrrhenian Sea. It is the birthplace of the Italian Renaissance, known for its history, traditions, culture, and artistic legacy of literature and music, as well as an area of Etruscan and Roman civilization heritage. Lucca, located halfway between Florence and Pisa, is a mid-size (89,000 population) ancient medieval city on the Serchio River in the Tuscany region of central Italy. It was first inhabited by the Romans in 180 BC. Known for the well-preserved Renaissance-era walls encircling its historic city center and its cobblestone streets, the broad, tree-lined pathways along the tops of these massive 16th-century ramparts are a popular pedestrian promenade for strolling and cycling. It includes many medieval basilica-type churches, wide piazze (plazas), ornate palazzi (palaces), interesting museums, and, of course, numerous fabulous restaurants serving delicious local Lucchese cuisine. Giacomo Puccini, the great opera composer of La Boheme and Madam Butterfly, was born in Lucca and his house is now a museum. You will be served 5 dinners throughout the stay. Please book your flight to arrive at Pisa International Airport (PSA) or Florence Airport, Peretola (FLR). Western Spirit Enrichment Center is a small holistic spiritual retreat facility that guides people on their inner journey of growth and transformation. This retreat requires a minimum of three participants to proceed and operate. Western Spirit Enrichment Center is not responsible for participant’s airline cancellation fees if this retreat is canceled.